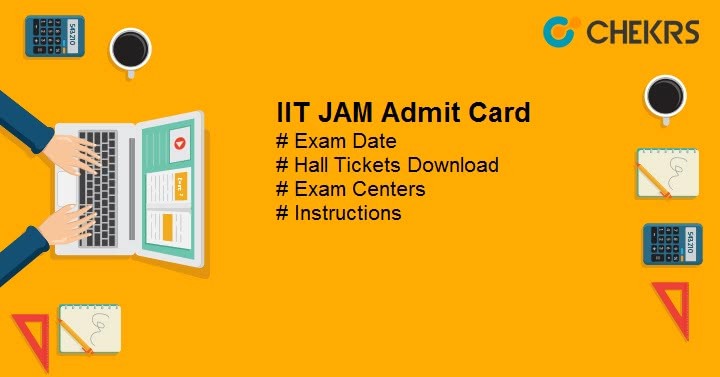 IIT JAM Admit Card 2019: IIT JAM 2019 Dates ate out now, and according to it the Admit card will be released on the 4th January 2019. IIT Jam Exam will be conducted on 10th February 2019. To appear in the exam candidates have to download, print out and carry the Admit card to the examination center. Latest Update 1 Sept.: IIT JAM 2019 Registration Started from 1st September, Check Procedure and other details below !! In this article we are providing you steps to download the IIT JAM Admit card, additionally, we are also providing the already announced IIT JAM Exam Dates, and some common instructions related to Hall Ticket and Examination. As we already said the dates and events are already announced thus here are the dates for Pre & Post IIT JAM Admit Card Events. We know you will search for the procedure to download the IIT JAM Admit Card or Hall Ticket. That’s why we are also including it here. The Hall Ticket will be available on 4th January 2019, It will be only available through the online mode on the official website. To Download the IIT JAM Hall Ticket you can follow the procedure given below. Go to the official website. And then IIT JAM Login page. Enter the Enrolment ID/Email ID and password there. Solve the given arithmetic expression and click on the submit button. After submitting the details, your admit card will be displayed in PDF format. Download it, and take a print out. #Note: If you forget your login details, then you can also click on ‘Forget Enrolment ID and Password’. After clicking on it, there will be three options available, Now select one of them according to your ease. Like if you have mobile and registered Mobile Number, and then Select OTP Option or you can also select Reset Password through Mail Option. IIT JAM Entrance Exam will be conducted at many centers in or near all major cities like Agra, Ahmedabad, AIIahabad, Asansol, Bareilly, Bengaluru, Bhopal, Bhubaneswar, Chennai, Coimbatore, Dehradun, Dhanbad, Dibrugarh, Emakulam, Faridabad, Ghaziabad, Goa, Greater Noida, Gurugram, Guwahati, Hissar, Hubli, Hyderabad, Indore, Jaipur, Jalandhar, Jammu, Jodhpur, Jorhat, Kalyani, Kanpur, Kannur, Kharagpur, Kolkata, Kollam, Kottayam, Kozhikode, Kurukshetra, Lucknow, Madurai, Mangalore, Mohali, Moradabad, Mumbai, Nagpur, Nanded, Nasik, New Delhi, Noida, Palakkad, Patna, Pune, Raipur, Ranchi, Roorkee, Siliguri, Thiruvananthapuram, Thrissur, Tiruchirapalli, Tirunelveli, Vadodara, Varanasi, Vijayawada, Visakhapatnam, and Warangal. Candidates are advised to match all the details on the Admit card. If found any mismatch or discrepancy/ wrong detail, Immediately inform the Organizing Chairperson, JAM 2019, IIT Kharagpur. Candidates have to carry the IIT JAM Admit Card to the Examination Center. They also have to carry one valid photo ID proof like Aadhaar card, Driving License, Voter ID, PAN card etc. Without the admit card and proper document, candidates will be not allowed to appear in the Exam. The admit card will not be sent by Post or Email. That’s it guys, We hope you will get the required information from this Article. If you have any query you can ask using the comment section below. Good luck for the Exam, and Keep Visiting.